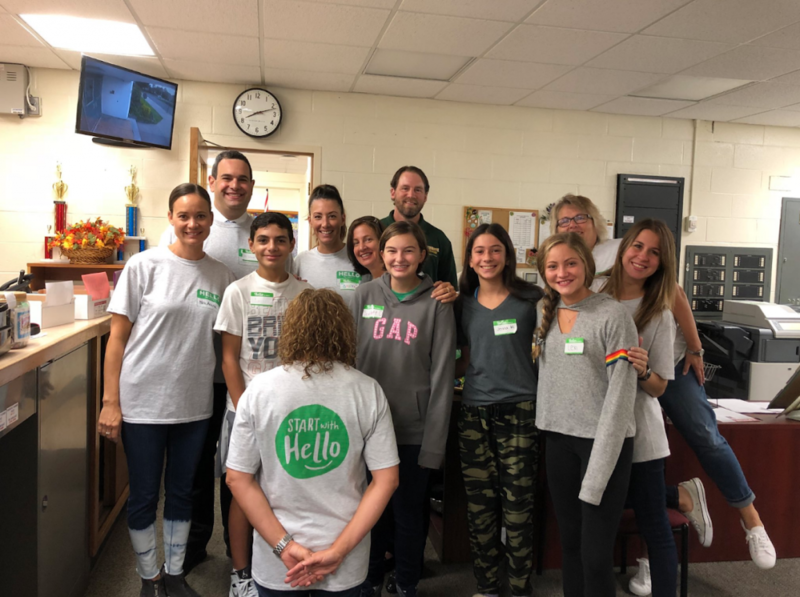 Students at Lynbrook South Middle School and West End Elementary School recently participated in Start with Hello Week, a national event organized by Sandy Hook Promise to teach students to be more socially inclusive and connected to each other and the community. During the week, middle school students participated in an array of different activities to promote inclusion. To kick off the week, students lined the hallways to greet their peers as they entered the building for the day and each received a sticker with their name on it to wear all day. The week continued with activities such as Human Bingo in physical education class to help students get acquainted with one another, a photo booth to enjoy with new friends and peers, a game called All My Friends to learn about others’ interests and a three legged race. Students at West End Elementary School also embraced the week with their own activities. Students learned how to make a difference with their peers in simple, fun and impactful ways. Teachers focused on how to recognize and reduce social isolation by having their classes participate in ice-breaker activities. Others read books filled with learning opportunities to help foster inclusivity in school and some students learned how to say hello in languages other than English.